A 14-year-old female was take into custody by the Columbia Police Department Thursday night and taken to the Judicial Center to meet with a Court Designated Worker. A 14-year-old female was taken into custody around 9:30 p.m. Thursday night and now faces several charges after a threatening message was discovered on a school bathroom wall. School Resource Officer Kevin Atwood was contacted around 3 p.m. Thursday after a message was discovered scrawled on a girls’ bathroom wall on the lower floor at the Adair County High School. The message was written with a dry marker, contained a satanic reference and said everyone would die at a certain time of day the following day. School officials and Atwood used the school district’s video recording system to determine who had access to the particular bathroom throughout the day. 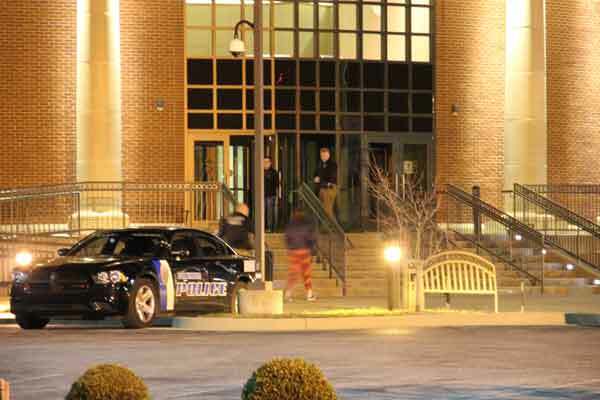 Robbie Harmon, school district director of pupil personnel, and Officer Atwood began interviewing students who had access to the bathroom, according to Josh Brockman, information officer for the Columbia Police Department. While police were investigating, Interim Superintendent Pam Stephens sent out a recorded phone message saying that graffiti had been found in the girls’ bathroom and that the safety of all students is considered the highest priority. The message went out around 8:30 p.m.
Around 9:30 p.m. Officer Atwood took the juvenile into custody. She will be charged with terroristic threatening, 2nd degree, which is a felony; criminal mischief, 3rd degree; and disorderly conduct, 1st degree, both misdemeanors, according to Brockman. Brockman said they believe the student acted alone and did not intend to carry out the threat. There were no weapons found or any evidence that she had prepared to carry out any type of attack. Officer Atwood is continuing the investigation. He was assisted Thursday night by Officer Brockman and Officer Drew Conn.